We could almost lament like the prophet Jeremiah about the situation of the Church in our times. We live in a time where the Church, “that Jerusalem which is above” (CCC 757) has in many of her members turned away from the Lord. Robert Cardinal Sarah during a visit to Belgium in early February even descried how high-ranking prelates in the Church are guilty of a “new betrayal” and have “abandoned” God. 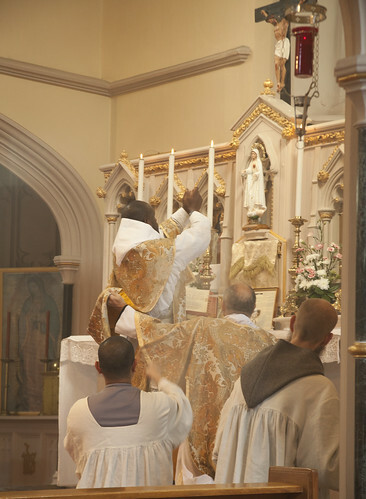 Cardinal Sarah has spoken on many occasions about a return the traditional practice of receiving Our Lord in the Blessed Sacrament kneeling and on the tongue. The forgetting of our rich Tradition in the Church has led to a crisis in faith – particularly in the Blessed Sacrament. Modern society has been enslaved by the ‘chief vice’ which is pride; this pride is what causes man to stop kneeling before his God, to say that he no longer needs God for his Father nor Mary for his Mother, the same pride which caused Lucifer to be cast out of heaven. For our times, it is key that we hear the cry to turn back to the Lord, our God. To do this will require humility; for us to truly be man and stop vying for the place of God. This is surely why we have seen a growth in religious orders, institutes and confraternities who faithfully offer the Tridentine Mass. The Mass of the Ages which expresses in a greater way the True Presence of Our Lord in the Most Blessed Sacrament. We must turn back to belief in the True Presence. We must turn back to True Devotion to the Blessed Virgin Mary. To that end the Marian Franciscans of Gosport have within the month launched an all new Radio App for Radio Immaculata – the 24/7 radio station run by the Friars. It has been encouraging news to hear that this year the pre-Pius XII Holy Week will be in use again around the country, and during the Paschal Triduum this liturgy will be broadcast LIVE out of St. Mary’s in Gosport on Radio Immaculata (radioimmaculata.org). The Friars wish this radio station to ‘Bring Forth Christ through Mary’, with the aim of assisting Catholics to turn back faithfully to the Lord in these times of trial for the Church and our world by devotion to Jesus in the Blessed Sacrament and devotion to the Blessed Virgin Mary.